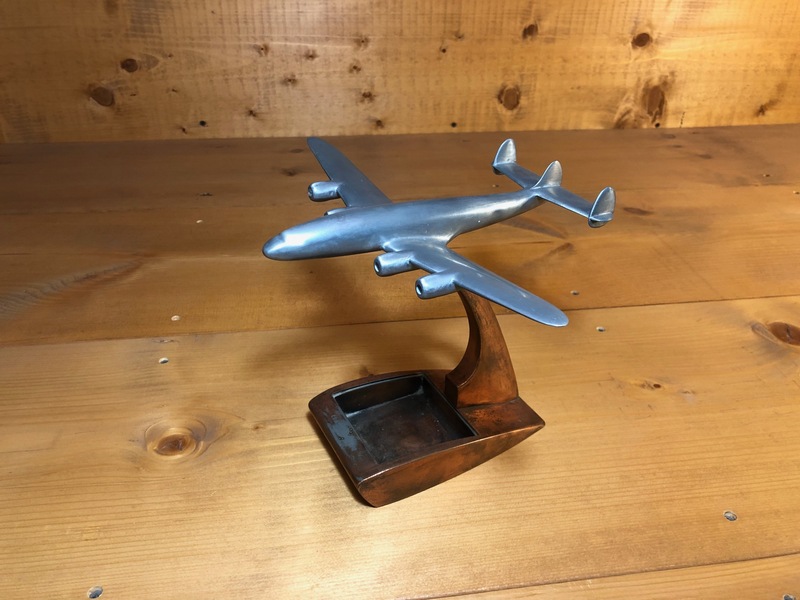 The triple tailed Lockheed Constellation, or “Connie” as it is affectionately referred to by pilots and airline enthusiasts, has been the subject of many excellent models. The Connie is such a beautiful design, that models of the aircraft are more like “artwork” than just simply models. The Constellation was designed in the late 1930s, and first flown in January of 1943. WW II prevented the Connie from going into commercial service. During the War, the Military was interested in the airplane and Lockheed continued to develop the Connie as the C-69 Transport. Only 15 of the C-69s were delivered to the Army Air Corps. A total of 22 C-69s were built. When the war was over, Lockheed began to convert Military C-69s into passenger carrying airliners. This was no small task as the C-69 was a whole different animal from what was to become a commercial Lockheed 049 Constellation. Many problems with the airplane had to be worked out before the airplane was ready for the Airlines. It was Pan American World Airways that first put the Constellation into commercial service on January 3, 1946 on a New York to Bermuda run. 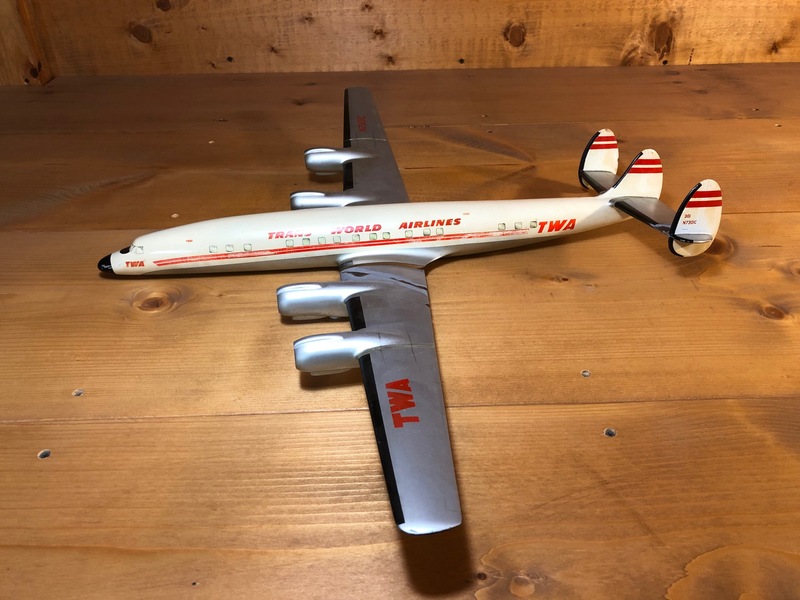 This is ironic because Howard Hughes and his airline TWA (Transcontinental and Western Air), had put so much into the design and development of the airplane in its beginning. The Lockheed factory itself, built early in-house concept and promotional models at its’ facilities in Burbank CA. These models were big (usually around 1/43rd scale or larger), and made of wood. These models could be found around the plant in engineering and executive offices. 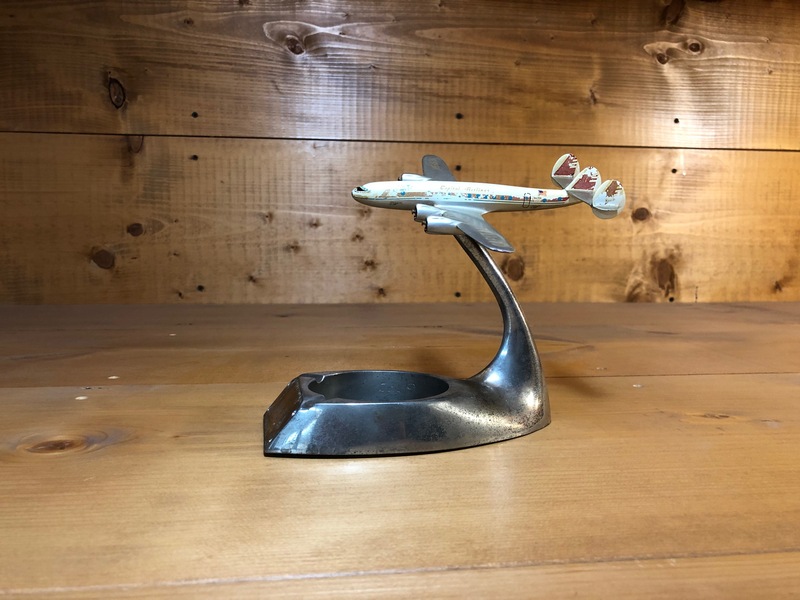 After the war the factory model shop got serious about making Constellation models for airline customers. The factory came out with magnificent “polished aluminum” hollow sheet metal models of the 049. Sheet aluminum was pressed into female molds to make halves for the fuselage, and top and bottom pieces for the wings and tail. Beautiful engine cowlings with rivet detail were also fabricated. The propellers were cast metal. 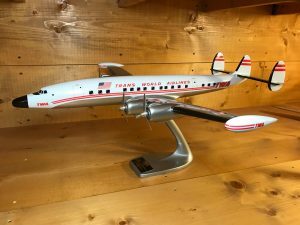 The sheet metal parts were skillfully soldered together, the seams were filed and sanded, and then the completed model was buffed out to perfection. Silk screened water slide decals were applied and the models were placed on a heavy cast aluminum stand. These models were made in 1/43rd scale. Most were “in flight-gear up” models, but some had landing gear with rolling wheels! To top that, Lockheed even made huge sheet metal Connies with wing spans well over 40 inches. 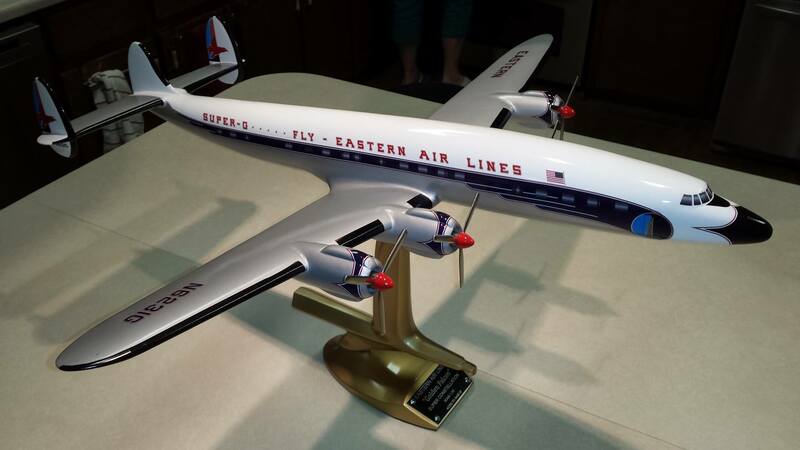 Eastern Air Lines ordered quite a few of these big models. 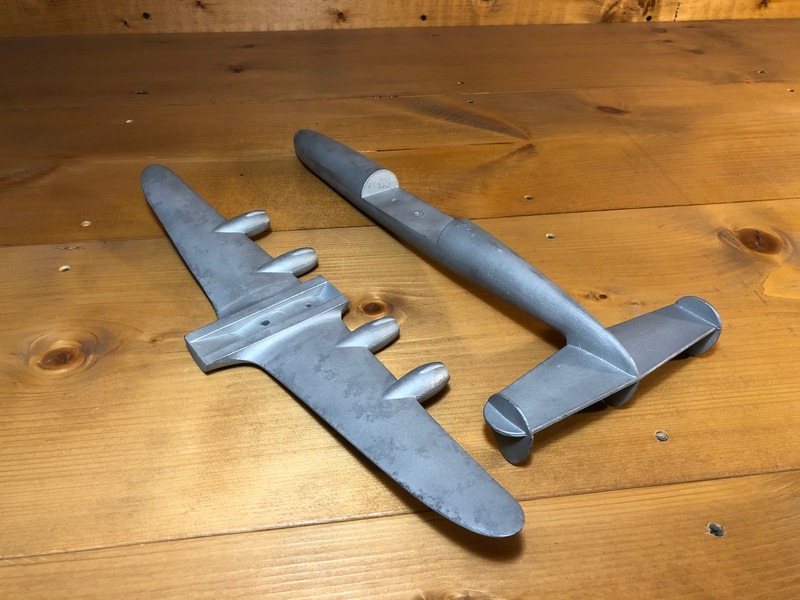 Most of the huge Lockheed 049 sheet metal models found today are ex-Eastern and have landing gear. Lockheed sheet metal models are a “must have” for serious vintage model collectors. These models are highly prized and demand very high prices. Lockheed also commissioned smaller models to promote the Constellation. While the smaller models were not made by Lockheed “in house”, they were still “factory issued”. These smaller models were made in CA by other vendors who did metal casting. When the Lockheed Super Constellation was introduced in 1951, many model makers worldwide had already been building Connie models. 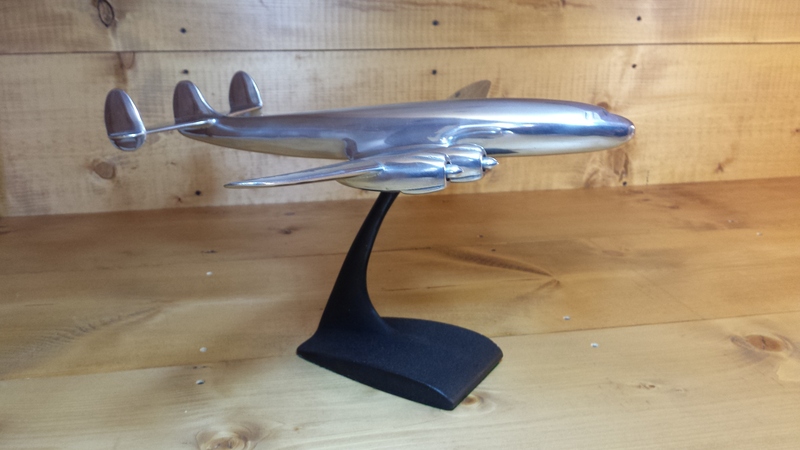 As a result, the Lockheed factory did not build any big metal Super Constellation models. They did however, build resin models of military Super Connies and special protypes. Most of these were in the 1/72nd to 1/60th scale, and they made some desk models that were about 8 or 9 inches long. 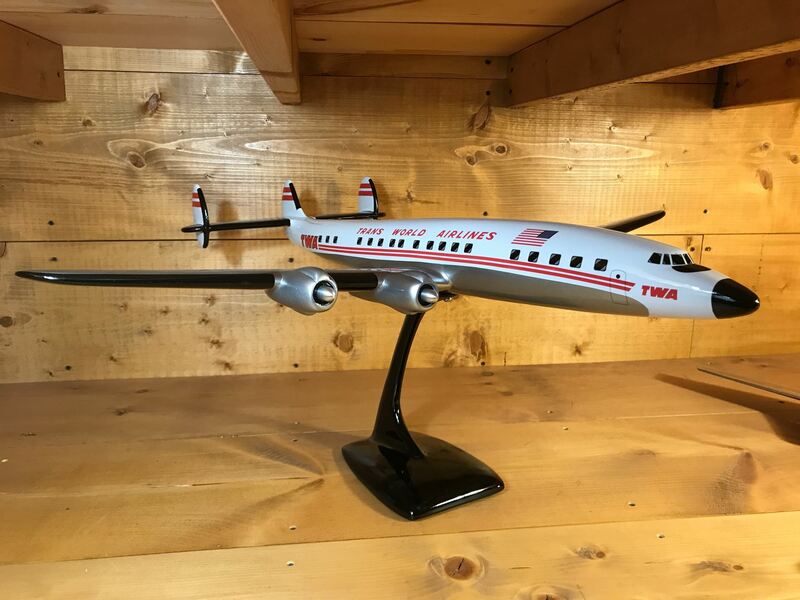 The Lockheed factory built some resin 1/60th scale 1649 models for TWA. Very few of these were made. 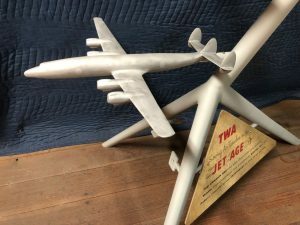 It is interesting to note that Sterling Riffe, owner of Riffe Models in Kansas City MO, used a 1/60th scale resin Lockheed factory 1649 model as a foundry pattern to cast the aluminum 1649 models he made for TWA and Air France in the late 50s. Raise Up Models of Rotterdam, Holland was perhaps the most prolific of all the aluminum model makers. 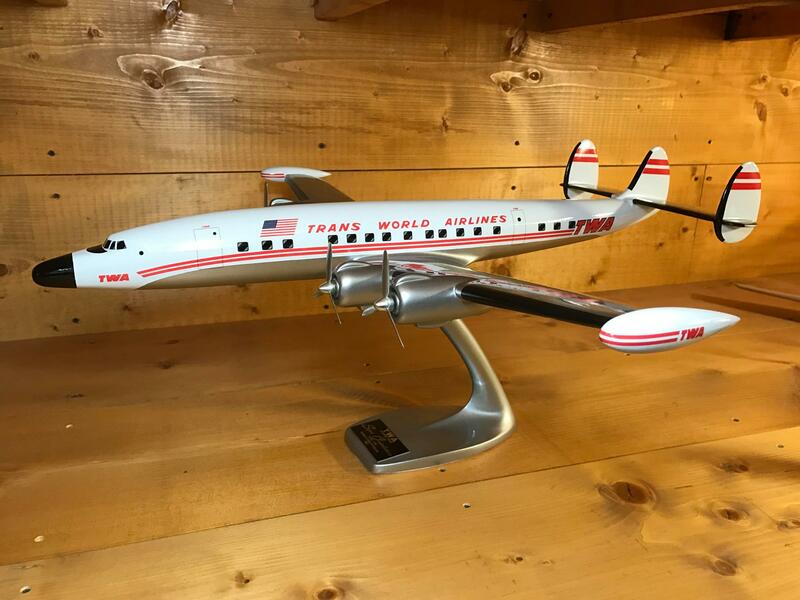 Raise Up produced thousands of models for the airlines from the 1940s to the mid-1960s. They made gads of Constellations in scales ranging from appx. 1/200 scale to 1/43rd scale. Raise Up Connie models were not always accurate (wings, noses, and tails), but, every now and then they would get it right and turn out a super nice replica. 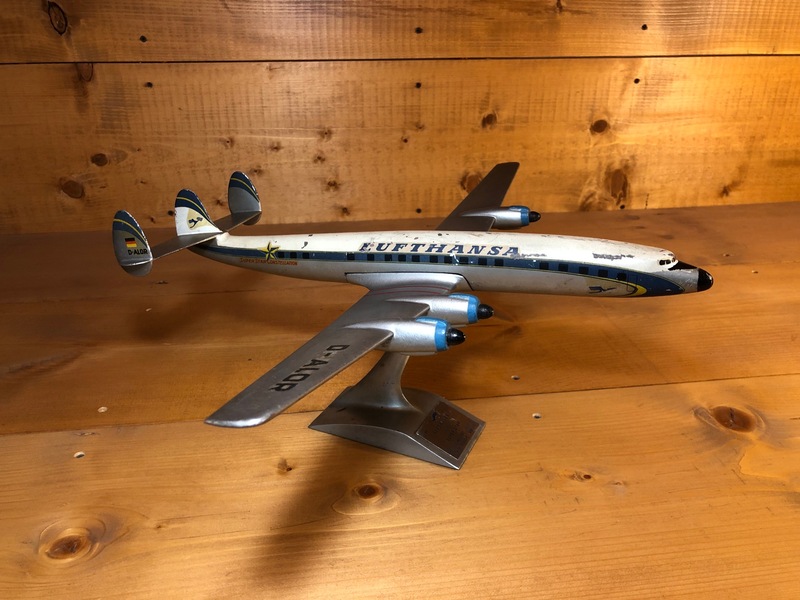 Schaarschmidt had a close relationship with Deutsch Lufthansa, and Germany’s national Airline was their best customer. Schaarschmidt made Constellation models of the 049, 1049, and the 1649. 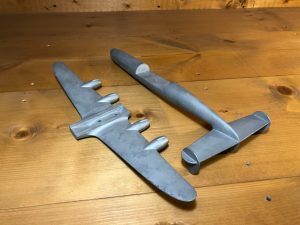 Most of the models were cast aluminum made in two pieces consisting of a solid fuselage and a separate one-piece wing. 1/100th scale being the most popular. A very unique thing about Schaarschmidt was that, for some reason, they made many models with a solid aluminum fuselage and hollow “sheet metal wings”. The sheet metal wing Connies ranged from very small ones to large ones that were approximately 1/50th scale. Today, finding a Schaarschmidt sheet metal winged Connie without “crushed wings”, is a real challenge. Schaarschmidt had a very recognizable stand that was simple and functional. Like Raise Up, some Schaarschmidt models were very accurate, but, in some cases pattern makers failed to pay close attention to cockpit and tail areas. Schaarschmidt 1/100th scale two-piece solid aluminum models were very clean and well done. The casting patterns were made in such a way that they almost always came out of the sand molds complete and without defects. 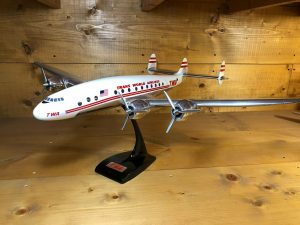 Peter V. Nelson models, in England, was another model maker that made many Super Connie and 1649 Connie models in the 1950s. 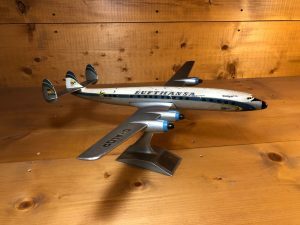 One recognizable feature that all Peter V. Nelson Constellation models had in common was that the front of the engines were always left “flat”. Nelson never “machined out” the engine intakes as did other model makers. Never the less, Peter V. Nelson models are highly sought out by collectors, and bring premium prices today. 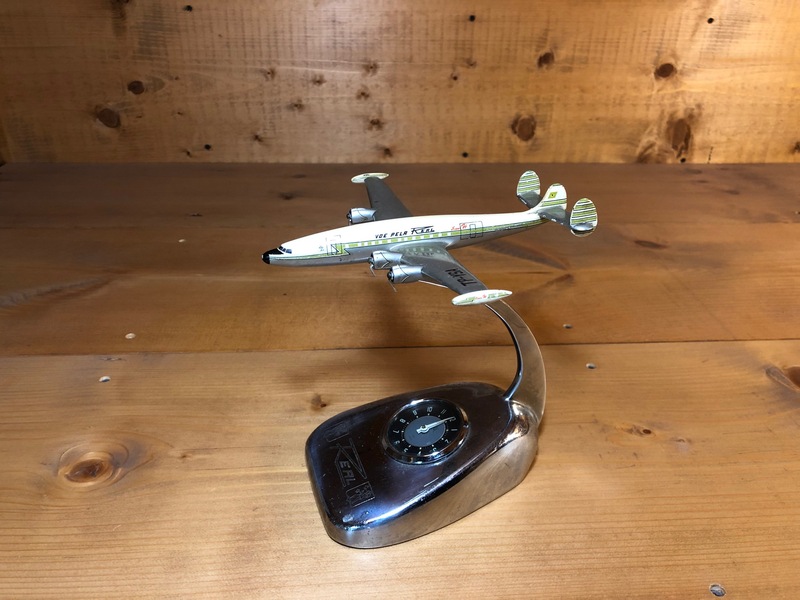 Manufacturer models of the Lockheed Constellation were made by many companies, so numerous, that this article cannot cover them all. Here is a short list of other major makers of “Vintage” Constellation models not covered in this article.